TOKYO--(BUSINESS WIRE)--Stem cell discoverer Prof. James Till, Professor Emeritus, University of Toronto, Canada who was awarded the Edogawa Niche Prize 2018 (www.edogawanicheprize.org), jointly by Nichi-In Centre for Regenerative Medicine (NCRM) and Jinsei-sha-Edogawa Hospital, Tokyo, Japan, has donated his prize money of One million Japanese Yen to establish a travel grant that will be named as “Joyce and James Till Travel Grant”. This grant will support travel and other associated necessities for young scholars from developing countries to take part in future NCRM NICHE event from 2019. The Fujio Cup Quiz (FCQ) on stem cells and regenerative medicine is an active knowledge gaining event of NCRM NICHE, held every year in October since 2006. The FCQ delegates are selected through a highly competitive three levels of testing; one online, another assignment and a pre-final on-site quiz participated by students from various domains of science related to regenerative medicine from across the world. 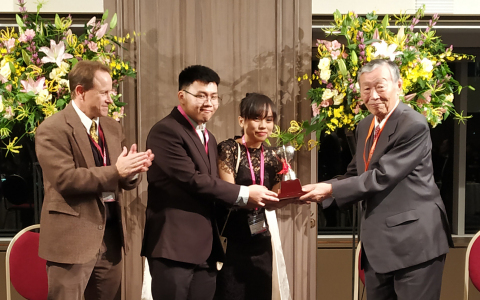 In the XIII Edition of the FCQ held on the 21st October 2018 in Shibaura Institute, Tokyo, the team representing Bandung Institute of Technology, Indonesia comprising of Grace Aprilia Helena and Tommy Octavianus Soetrisno Tjia emerged to be winners of the FCQ 2018. Awarding the winning team, the prestigious Fujio Cup, Dr Shojiro Katoh (President, Edogawa Hospital) said that their organization will continue to support such educational activities. The event was participated by Prof. Masaru Iwasaki (Vice President, Yamanashi University, Japan) and Dr Ian Gallicano, Georgetown University, USA, who commented that participation in this active knowledge gaining event will add value to the profile of the students. Many students after visiting premier institutes in Tokyo involved in regenerative medicine research expressed their interest in pursuing their higher studies in Japan.